“She was in love with another man…” These were literally the first words that I read in a random case file from the Charles Loomis Dana papers of the early 1920s. Obviously this was going to be a collection that would be easy to get lost in. Dr. Dana’s case files from 1919–1929 comprised the first collection of more than a dozen that I processed for the New York Academy of Medicine as an intern this fall. Here are highlights from about 10 of them, which offer an intriguing look into the history of medicine and society in the 19th and 20th centuries. Contact history@nyam.org if interested in using any of these collections. Please note, some of these collections are on deposit and have specific rules that govern their use. Finding aids to these collections will be available online in early 2016. Dr. Charles Loomis Dana was born in 1852 in Woodstock, Vermont to an old and prominent New England family. He studied medicine in Washington, DC, and in New York, graduating from Columbia University College of Physicians & Surgeons in 1877. He went on to become a professor of physiology at Women’s Medical College and later of nervous and mental disorders at Cornell Medical College. Dana’s case files include individuals of all ages and from all walks of life—from countesses to schoolboys, stenographers, governors, and laborers. There are also many patients with on-the-job injuries whose examinations were requested by the Department of Labor for workmen’s compensation matters. A case file from the Charles Loomis Dana papers. The patient name has been removed from the image for privacy. Dr. Dana often worked with Dr. Gladys G. Tallman, director of the psychological laboratory at the Neurological Institute of New York at Columbia University, and her detailed and thorough examinations of many patients are part of the files. The most common diagnosis for men seems to be paranoia and for women, depression, hysteria, and anxiety. Elderly men often suffered from depression as well. However, the range of diagnoses was actually quite wide and included tinnitus, insomnia, neuralgia, asthenia, vertigo, dementia praecox, encephalitis, drug addiction (most often morphine), “traumatic psychosis,” and “weak arches.” Patients came from not only the New York area but from all of the Eastern U.S. and some from as far away as Havana. Like the range of Dr. Dana’s patients, the variety of subject matter and materials preserved in the collections that I processed is wide. What organizations or individuals choose to save and the way they organize and preserve these materials is fascinating and a big part of the appeal of archival work for me. The New York Pediatric Society records, 1930–2011, contain much of what one would expect to find in the records of a medical society. 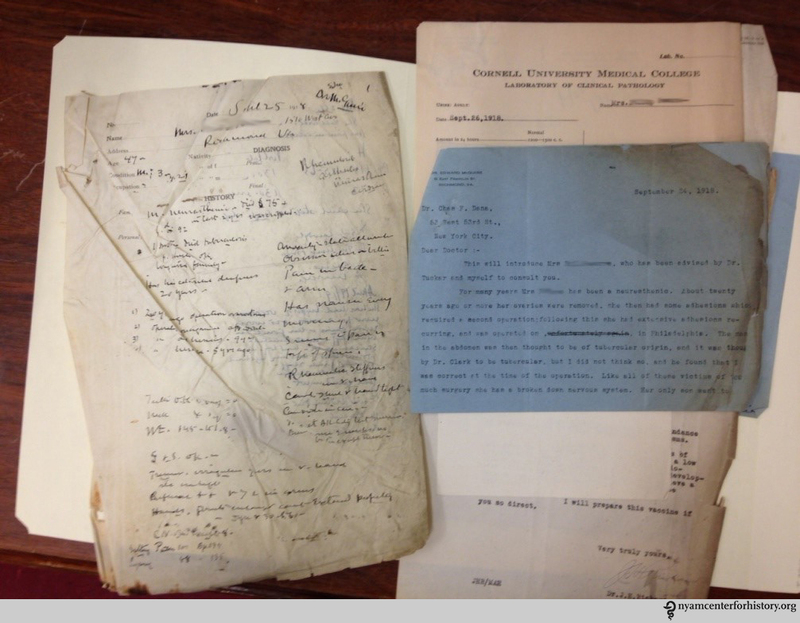 However, these papers, minutes, and correspondence also document the prevalence of tuberculosis in the 1930s. This documentation is followed by the development and use of the antibiotic streptomycin in the 1940s, and then, decades later, the first appearance of drug-resistant strains of tuberculosis as shown in the 1967 papers of the society and continuing with the rapid rise of those resistant strains into the 1980s. Papers on the polio epidemic of 1944 are also here, as is the evolving research regarding vaccines, diet, and nutrition for children. 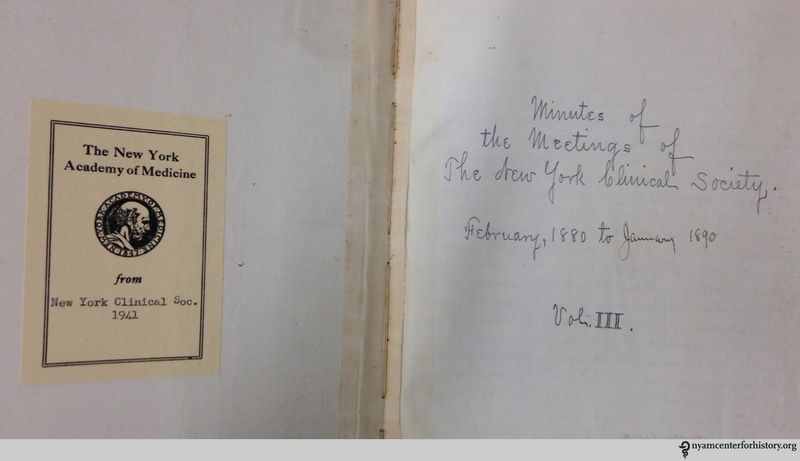 The New York Clinical Society records, 1877–2005, include bound manuscript records of its earliest minutes (1877–1912). At meetings, members offered presentations like the “case of a man with a curious form of venereal disease” and also an “opium habit” (February 22, 1878); a boy with protruding ears who was helped by surgery—“the result is admirable…the lad of 16 years had been subjected to so much mockery at school” (May 27, 1881). On March 25, 1904, “Dr. Gibson presented specimens of gall stones removed from a lady who had symptoms of intestinal obstruction” including “a gall stone about the size of an olive pit.” The minutes of May 27, 1910 document “a peculiar case of typhoid fever” which was “probably not typhoid but ‘New York Fever.’” By the 1980s one of the papers presented included “Orthopedic Aspects of Classical Ballet” and “In-Hospital Nutrition or How to Starve to Death in New York City”—a long way from the gallstone samples of 1904. On October 25, 1982 a paper, “Acquired Immunodeficiency,” was presented—“This recent and fascinating disease picture which has become so prominent in our N.Y. area.” Again, this collection offers primary-source documentation as the story of the epidemic unfolded. During the 1980s the meetings of the society were held at the Century Club. The menus and wine labels from those occasions have been preserved as well. Read more about our archival highlights in Part 2 of the blog. This entry was posted in Collections, History of medicine and tagged American Urological Association New York Society, archival collections, archives and manuscripts, Charles Loomis Dana, internships, New York Cardiological Societ, New York Clinical Society, New York Gastroenterological Association by nyamhistorymed. Bookmark the permalink.